Boulonnais horses come from France. They are legendary creatures that were brought from France by Julius Caesar during his preparation to invade Britain. They were once known for roaming many lands such as Calais, Belgium, Eterpigny, and along the English Channel in the United Kingdom. 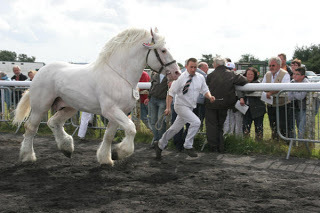 Most of the heavier draft breeds were bred in the Northwestern areas of France. They are often referred to as the Thoroughbred of the draft breeds. This was as a result of their elegance that they received from the bloodlines of some Arab and Iberian horses. While they are recognized as being derived from the seventeenth century, some feel there were in fact two various styles of the breed. One was noted as the heavier draft version and the other is the smaller one called the horse of the tide (they were sometimes utilized to transport fish from the areas of Boulogne to Paris). They went on to struggle with extinction as the people of their towns began using motorways and cars to get around town. It is unknown at this point in time if a true full bred Boulonnais horse still exists in France, or anywhere else in the world for that matter. Boulonnais horses are calm and generally very easy to get along with. They are one of the quieter and reserved breeds. They make for a very good work horse as they tend to be quite obedient and eager to please their masters. They're simple to care for and overall well mannered. They stand at around sixteen hands in full grown size. They are bred in chestnut, bay, and gray shades. With refined head and a prominent wither; their looks are powerful and sweet at the same time. They have good legs and high feet with a sloping croup. Their coats are silky and polished with a marble pattern in most cases. They also have shorter necks for a horse this size, but they have very strong necks that are excellent for carrying or pulling for their owners.